Configuring user authentication for more information. LDAP authentication relies on local configuration and may involve obtaining a privileged access token from the LDAP administrators. Local accounts remain available for all instances. Whichever authentication method is used, there is no difference in how users interact with LAVA once logged in. A local user account may be created by an administrator within LAVA. The administrator may grant different permissions to the user to perform various operations within LAVA. A typical login screen will look something like the following. To log in with a username and password, enter your credentials in the provided text boxes and click “Sign in with username and password” button. Local user accounts can be particularly useful for automated users like build systems or continuous integration scripts using the XML-RPC API. The local admin can create the user with a secure password, log in as that user to create a token and then supply the token to the scripts. Linaro’s central validation lab in Cambridge is accessible via https://validation.linaro.org/ . It is Linaro’s core production instance of LAVA. 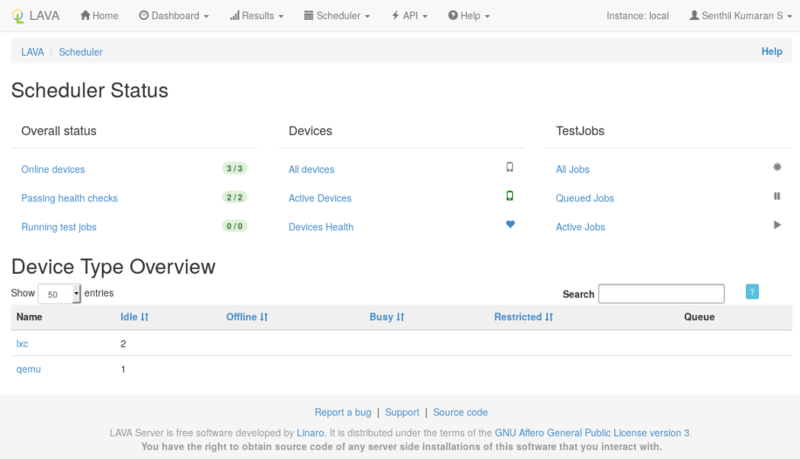 This lab is configured to use Linaro LDAP. To log in, enter your details in the LDAP login fields. If your Linaro email is first.second@linaro.org then use first.second as your username. If you do not have a Linaro LDAP account, you can register at https://register.linaro.org/. In order to securely access LAVA resources via XML-RPC APIs using lava-tool or XML-RPC clients, users first need to create an authentication token. Click on the “New” button on the above page which raises a dialog box asking for a “Description” of the token to help you identify and delete tokens - if required at a later stage. Click on the “Create” button to generate the token. The token will be assigned a token number (which is autogenerated by LAVA). To display the token that was generated above click on the green “Display this token” button in the Actions column on the above page. If a token is compromised, it can be removed by clicking on the red “delete this token” button in the Actions column. Anyone using that token will then no longer be able to authenticate as you in the system.